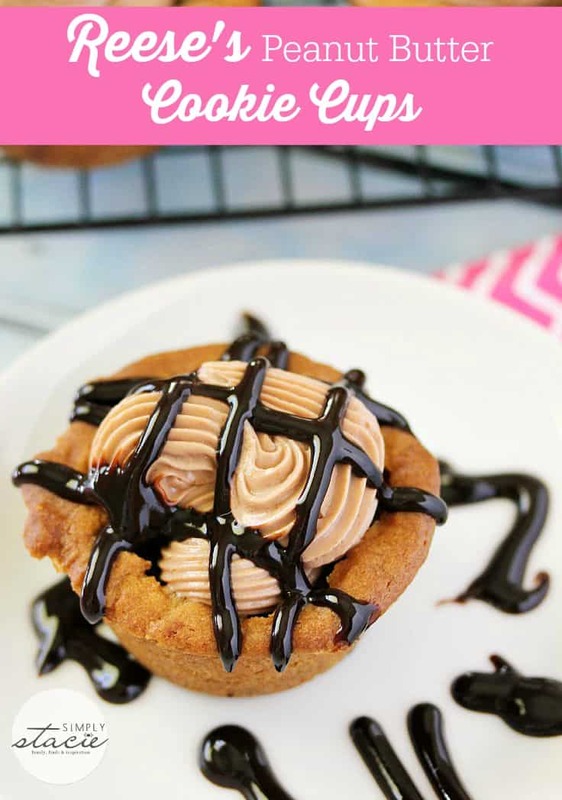 Cookie cups are on my mind! I’ve been having lots of fun creating some new recipes. My sweet tooth is very satisfied. In this recipe, I used two Reese’s products – Reese’s Chocolate Peanut Butter Spread and Reese’s Peanut Butter Cups. They turned out perfectly! 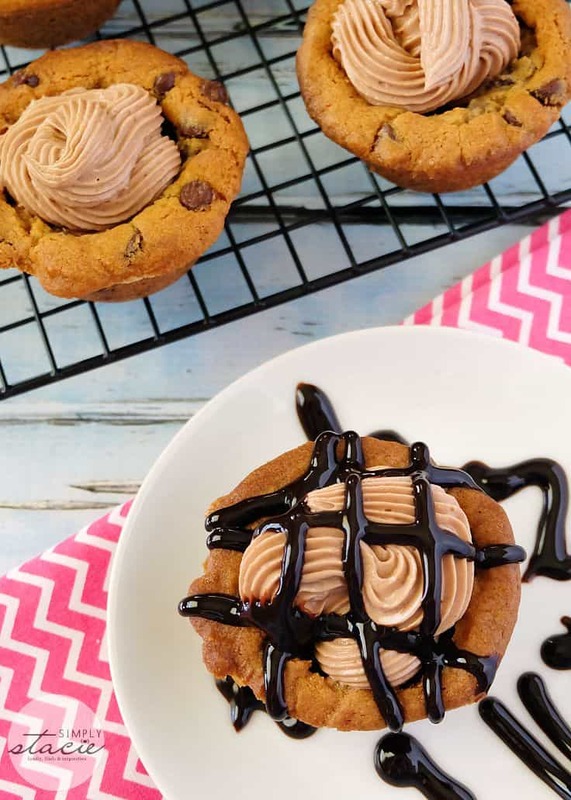 The cookie cup itself is made from Pillsbury Chocolate Chip refrigerated dough. It’s so easy to work with. At the bottom of the cookie cup is a Reese’s Peanut Butter Cup. Then I piped in chocolate peanut butter filling made with cream cheese, icing sugar and Reese’s spread. Talk about decadence! Just look at that! I had to cut them open to show you what it looked like inside. Sink your teeth deep into one of these wicked treats. I finished them off with a drizzle of chocolate sauce – the kind you use on an ice cream sundae. 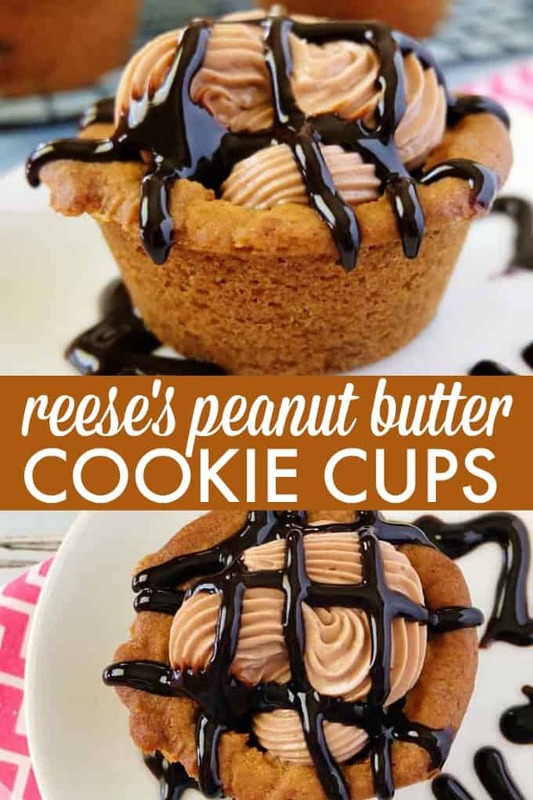 If you are a fan of Reese’s or the chocolate/peanut butter combination, you need to try this recipe! If I can ever find the Reese’s White Chocolate Peanut Cups, I’ll make a white chocolate version. Those are even better, in my opinion! Are you a fan of chocolate and peanut butter? 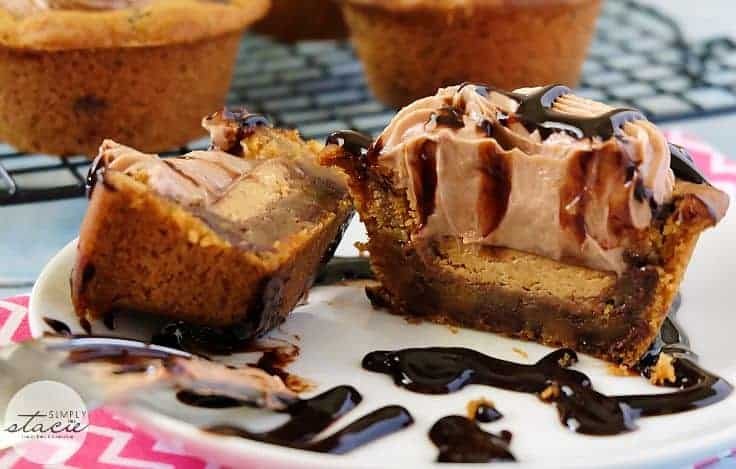 A decadent recipe for Reese’s Peanut Butter Cookie Cups. 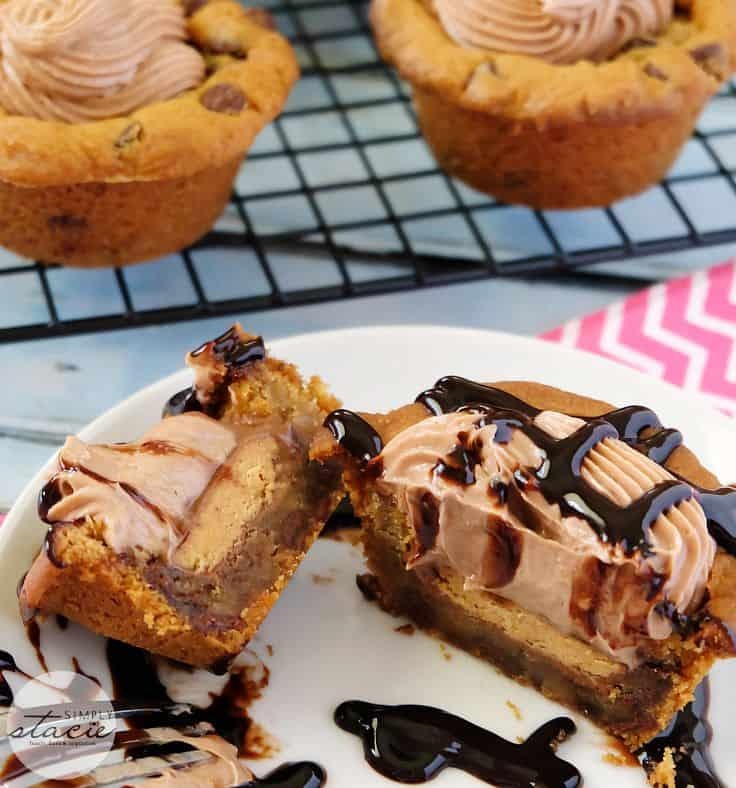 A chocolate chip cookie cup stuffed with a Peanut Butter Cup, creamy peanut butter & chocolate filling and a drizzle of chocolate on top. Again, remove from oven and with a small spoon, deflate the centers of the cups while leaving the sides of the cookie cup untouched. Carefully place a Reese’s Peanut Butter Cup at the bottom of each cookie cup. 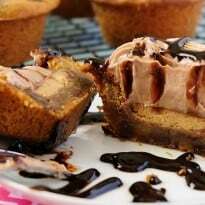 In a mixing bowl, whip cream cheese, icing sugar and peanut butter chocolate spread together until light and fluffy. Cool in the refrigerator until ready to serve. 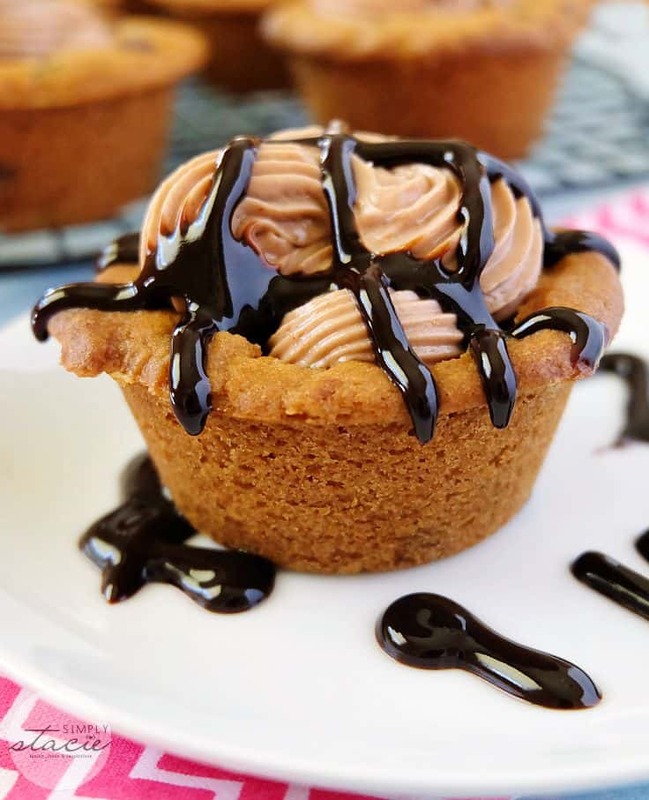 When ready to serve, drizzle chocolate topping over the cookie cups.